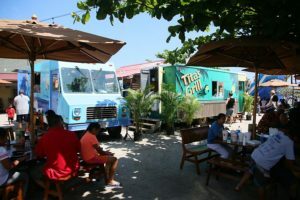 The Polynesian Cultural Center (PCC) welcomed renowned chef Sam Choy to the Hukilau Marketplace this weekend with the opening of his new food truck, Sam Choy & Tita’s Seafood & Poke Truck, in the Roulotte Court of outdoor eateries. Also opening today at the Hukilau Marketplace were So’Da Bomb and Fia Fia Farms, along with My Island Spa, a massage spa station, all of which was in celebration of the Hukilau Marketplace’s second anniversary. Additionally, guests enjoyed live performances by Vaihi and Roots Rockaz, along with fun keiki activities including inflatable slides and face painting. Located at the entrance to the PCC, the Hukilau Marketplace highlights the traditions of Laie and the North Shore, featuring local cuisine and retail shops that showcase the unique heritage of the area. Admission and parking to Hukilau Marketplace is free to the public. Also offered at Hukilau Marketplace are Pounders Restaurant, Hapa Home Store, Na Hoku, Jaseboards and Polynesian Wood Carving. Sam Choy & Tita’s Seafood & Poke Truck – Owned by chef, restaurateur, and television personality Sam Choy, one of the founders of Hawaii Regional Cuisine. 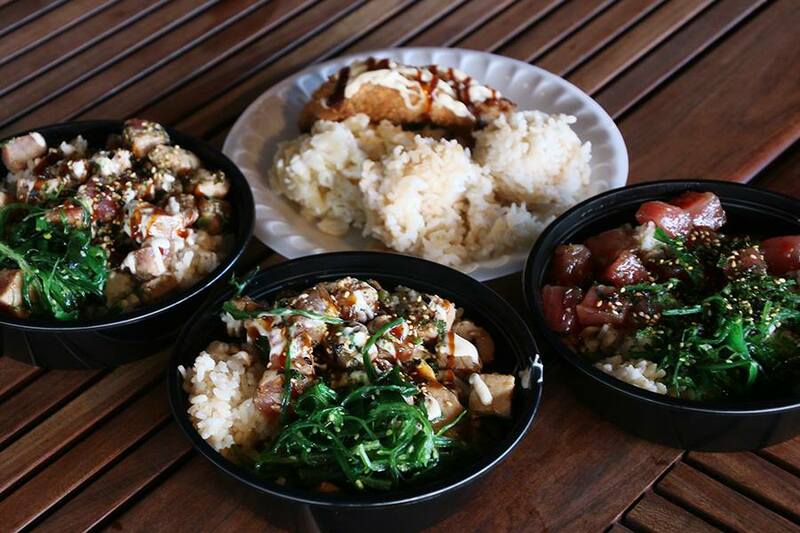 This food truck will offer fresh seafood and ono poke. So’Da Bomb – Owner Kalin Uluave will serve a variety of fountain drinks. Guests can add different pumps of flavors to their favorite soft drink. Fia Fia Farms – A must try is the specialty patented Mango Otai. Fia Fia Farms also has fresh fruits to enjoy and bananas to be freshly picked from the bunch. Tita’s Grill – The popular Kahuku eatery run by the local Ah You ‘ohana (family) offers some of their most popular dishes, including generous plate lunches, loco moco, several varieties of burgers, stir-fry, kalbi ribs, and Tahitian steak frit. Island Scoops – Featuring hand-scooped ice cream in local flavors such as Macadamia Nuts and Haupia, as well as traditional options including Rocky Road and Cookies and Cream. Délice Crêpes – Sweet or savory? Choose from a selection of creative crêpes, such as the S’More with marshmallow, chocolate, and graham crackers; the Tahiti with coconut; the Butter Cup with peanut butter, chocolate and banana; or customize your own from a choice of 14 crêpes or waffles and 20 toppings. Island Breeze – Concoct unique flavor combinations at the self-serve flavor station. Choose from pina colada, strawberry, mango and banana. Then add condensed milk or a scoop of ice cream to create a truly delectable and refreshing treat.